This is a slightly different blog post from what we usually talk about. It is supposed to introduce you to a fascinating project that Abby, Jan and I (all MSc Conservation students who you have heard from in the past in previous blog posts) will be involved with this summer. Although our degree has archaeology in the title, you may have noticed that these posts very rarely talk about the adventurous excavations of lost civilisations in foreign lands. Well that is about to change! The three of us, also known as the GTCT (Greatest Tanzania Conservation Team) will be going to Olduvai Gorge in – you guessed it – Tanzania this summer! We will be in pursuit of some hard-fast evidence about the lives of early man and woman. This famous site is right at the heart of the theory that humanity’s origins are to be found in East Africa. The archaeological research at Olduvai focuses on the transition between the Oldowan and the Acheulean. Both these groups are steps in the line of the human biological as well as technical evolution. The archaeologists on site will therefore be looking both for human remains that can give some insight into the biological stages of our development, as well as for ancient stone tools that can shed some light on our early technical developments. The finds from Olduvai Gorge go back as far as 1.7 million years! Our contribution to these grand questions will be to try to stabilise these fragile finds so that they can safely be studied. We will also try our hands at excavation by helping out with the lifting of particularly fragile finds. 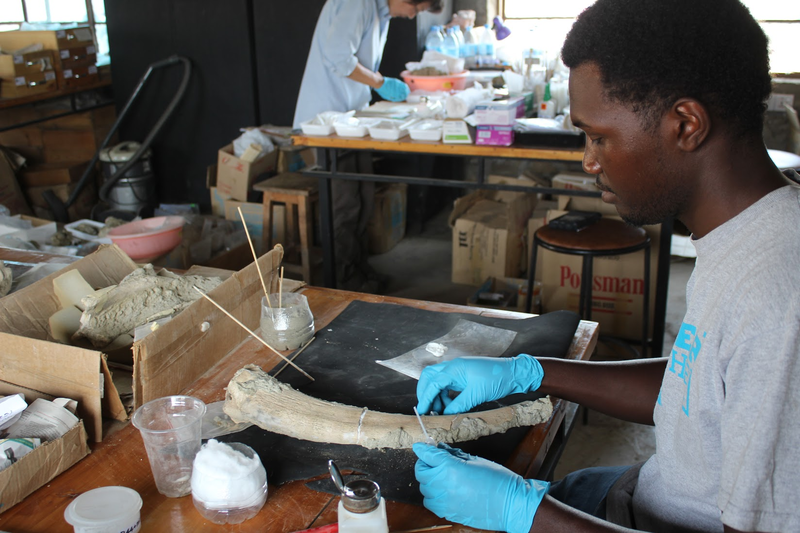 A Tanzanian student in the Laetoli Lab working on a horn core during last year’s excavation. Hopefully, this will be us soon! Photo courtesy of OGAP. We are now in the final weeks of preparations before the departure of GTCT in early July! We are getting our vaccinations and gathering our tents, travel showers, and tool kits. We can’t wait to jump in and we hope you will stay tuned for updates during the excavation! If you would like us to send you a postcard, we will happily do so in return for a small contribution to our travel fund. We are so close to going but we still need to raise the last of our balance to make this trip a success! You can help by contributing here or by spreading the word about our project. Thank you for any help you can give! Find out more about the conservation at Olduvai Gorge here.